The MC4000 is a portable controller that’s solidly built for the modern professional DJ. For those looking for a well built, professional device that ticks all the boxes for mobile work but also has enough features for full-on beatmixing, club-style, this controller pretty much has it all. The MC4000 continues Denon DJ’s mission of providing great professional controllers for working DJs, the kind of gear that sounds fantastic and that you can rely on night after night. Reassuringly heavy. Nothing has really changed as far as build quality goes here, with the usual high standard apparent from picking up the box, before you even open it: When you do, you see that this is a heavyweight device, sober and businesslike, in black metal. The jogwheels are more Numark than Denon, but that’s fine – they’re completely solid with not a single sign of any “give”, and just the right amount of weight / tension to feel natural in use. The Denon DJ MC4000 has Master and Booth outputs as well as two mic inputs, which are sure to please mobile DJs. Apart from the obvious difference of a shift in jogwheel design from “old” Denon, the knobs and even the typeface used give a nod backwards, and users of previous Denon controllers will feel at home here. One nice thing about this controller, though, is the fact that (partly because it only has two channels), everything is laid out just that little bit more logically; one criticism of some previous Denon devices was that they were fiddly. Not so here, with just enough space around everything to make it easy to use. The fact that the controller is designed primarily for the mobile / professional DJ is clear from the outset. 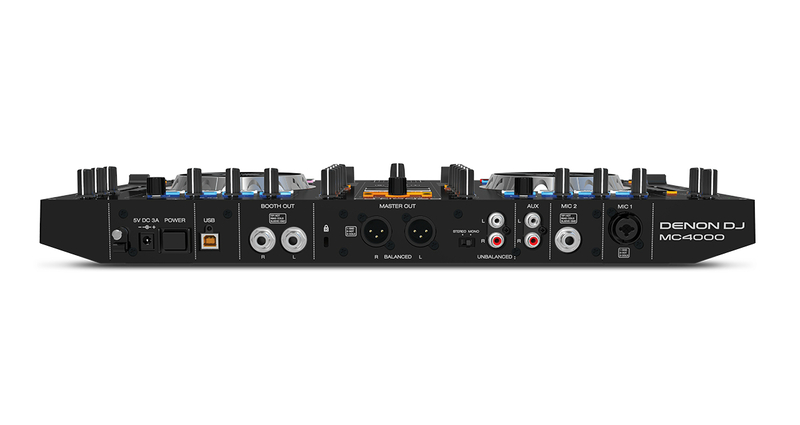 Accordingly, there are two mic channels with echo and twin-band EQ for each; a split cue button; a mono / stereo button for the output; a censor feature; balanced booth outs alongside jack and RCA master outs; some classic pitch bend buttons (a la CDJs); very long throw pitch controls; a Kensington lock fitting; and interestingly, four sample trigger buttons with an independent volume away from the cue pads (better to have them separate for mobile DJs, for triggering idents etc). The controller comes with Serato DJ Intro software, with a half price voucher code for upgrading to the full version, something of course that any pro DJ would want to do. 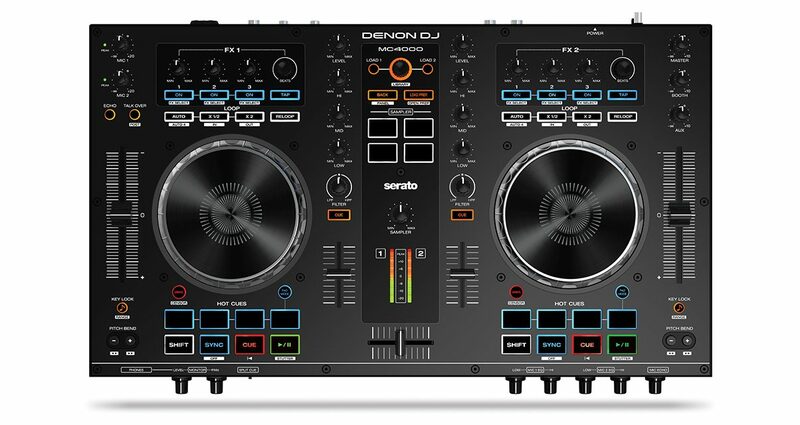 This presumably allows Denon DJ to keep the price point low initially, and kind of makes sense as many DJs would already own Serato DJ, so paying for it again in the price of a controller is an unnecessary hit. As ever, Serato makes installing and using the software easy (the upgrading is in-app, too), so the only extra hoop to jump through is installing a driver if you’re using Windows as opposed to Mac. Once installed, plugging in the controller in is the last step, and everything “just works” – no extra settings required. Plug in your headphones, speakers, mic, and you’re ready to go. Though the MC4000 looks like it has eight pads, the bottom four are actually transport controls, so you’ve only got four hotcue pads here. The MC4000 is a joy to use – if what you’re looking for is a pro two-channel controller for mobile use, that is. It lacks four software channels, and also lacks “controllerist” features like slicer and a full “slip” mode (but see later to see how this idea has nonetheless been implemented partially); plus, you don’t get on-jog fancy lights or stuff like that. 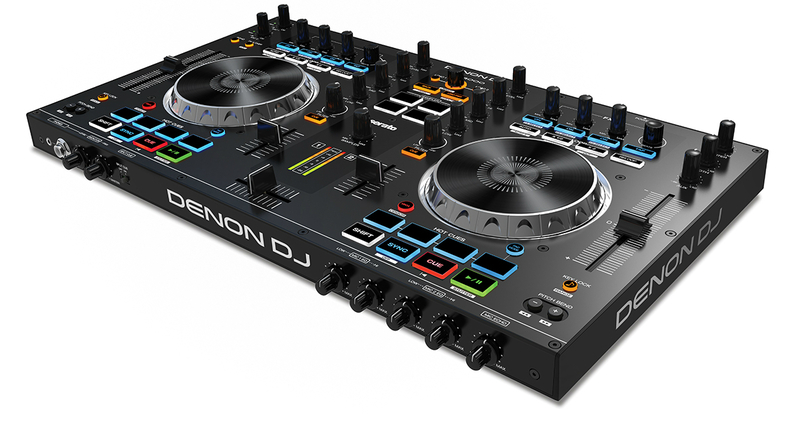 Truth is that Denon DJ is gambling that many DJs don’t want these distractions, and for what it’s worth we think the company is on the money here. The two banks of eight pads underneath the jogwheels aren’t really what they seem, as the lower four pads are transport, sync and shift controls, and only the upper four control any type of performance features. The features they control are all eight cues (split over two “modes” – you access modes by holding down the “pad mode” button and pressing one of the four upper pads), a cue loop mode, and a loop roll. It’s this loop roll that has a “slip” functionality, because when you select it and perform a loop roll using the pads (the rolled amount doubles from left to right on each pad), as soon as you stop, the track carries on playing from where it left off. This covers off the main use of “slip” out there in the real world, so the absence of further Slip functionality isn’t a huge blow by any means. Looping itself is handled by four buttons above each jog. “Auto” simply enables a loop at the length the current loop is set to in software, so you could leave it at four beats, four bars or eight bars, for instance, and engage with one button (holding Shift and pressing the Auto button always engages a four-beat loop no matter what the software loop length is set to). There are loop half and double buttons, and a Reloop button for immediately jumping back to the last-used loop. There’s also manual loop in and out, and you can adjust the exact points using the jogwheels (good for looping non-electronic beats for beatmixing). The FX are totally standard Serato, meaning three FX pots, on / off buttons, and “Shift to select”, and there’s the usual Beats knob for FX cycle length, with a Tap button for manually entering this. 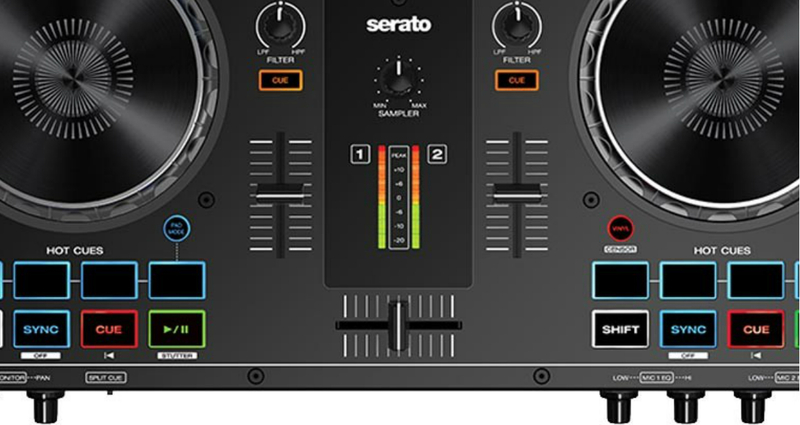 A Panel function lets you switch on and off Serato’s extra panels like the FX, sampler etc. The MC4000 has a pair of VU meters that display both Master and headphone cue levels. Of course, each channel has manual gains, and there is also the expected three-band EQ, plus a slightly larger Filter knob for each channel, too. The channel faders are reassuringly resistant and smooth, and while this mixer isn’t primarily designed for scratching (all crossfader adjustments are in software), the crossfader is nonetheless nice and loose (we have a separate scratch video for you below). There’s a key lock on / off button, which doubles as a pitch fader range control with Shift, and you can switch Vinyl mode on or off to cycle between the jogwheels being “nudge” all the time, or “nudge” on the edge and “scratch” on the top. Again, pretty standard stuff. The library section is simple but well implemented, with a sure, stepped rotary encode for scrolling, and deck load buttons, plus a nice preparation section so you can open and add to a prep window without resorting to computer keyboard. While there are no separate master and cue VU meters, the ones that are there work intelligently, letting you monitor both the master out and the individual cues, but it’s quite confusingly done, and I’d like to see this improved in a firmware upgrade down the line, unless I’m missing something obvious (it has been known, to be fair…). Separate Master and Booth output volumes are provided, and there’s also an Aux In so you can plug in a backup source should your laptop crash, for instance. The Aux In is routed straight to output, with a single volume control (ie not through software). The mic channels are 1/4″ jack and combo (XLR & 1/4″ jack), and nice and versatile, although I’d rather have seen reverb than echo as the in-built Mic effect, as it all gets a bit gangster with the echo up high! I guess the echo effect turned down low (there’s a knob on the front panel for this) would pass for a bit of reverb, at a push. One nice Mic function is a “Post” option, which feeds the mic to the main speakers but not to the booth, helping you to avoid feedback – again, a typically thoughtful feature for the working DJ. The sound quality is excellent, and a step up from the 16-bit audio interface in previous controllers from Denon DJ to a 24-bit one (44.1 & 48 kHz, not that this is a particularly decisive indicator of how good a controller will sound). However, in this case, we found the MC4000 clear, loud and throughly pro-sounding. The MC4000 ticks a lot of boxes for mobile and working DJs, and keeps its price down by omitting features that that audience doesn’t really need, such as controllerism features and extra inputs. 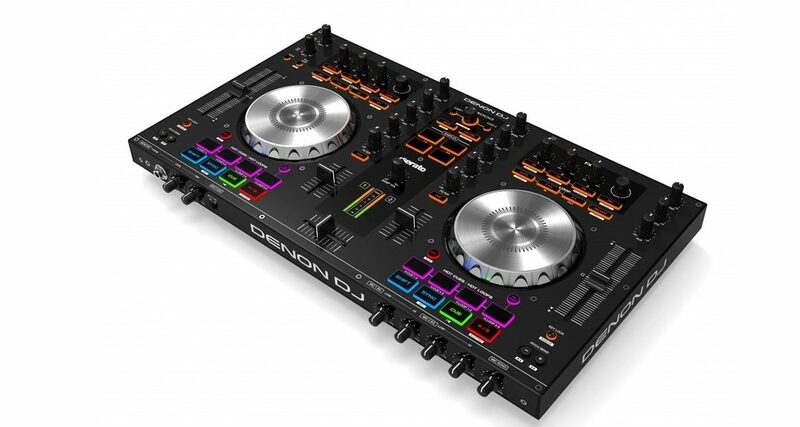 Some worried when inMusic took over Denon DJ, but this controller shows the company has understood the market Denon DJ was strong in, and built on the strengths of previous controllers. For the working DJ looking for a well built, professional device that ticks all the boxes for mobile work but also has enough features for full-on beatmixing, club-style, the MC4000 pretty much has it all. 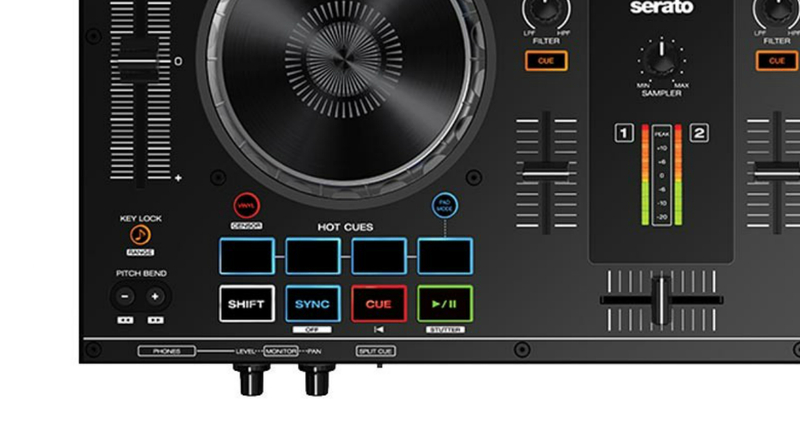 It acknowledges that software DJs only really need extra inputs for backup, so it provides such a facility with the Aux through, and it also acknowledges that mobile DJs need good and plentiful mic inputs, the two mic channels provided here giving scope for, say, a wired mic (for DJ use), and a wireless mic (for “best man” / “father of the bride” duties at wedding, for example, or for a “roving MC” at a rave!). These things are in all seriousness important, because mobile DJs often have to carry a small mixer with them to be able to add mics, backup sources etc to underspecified controller, but the MC4000 on its own would be sufficient for such gigs, meaning all you’d need would be your PA system and this to complete a compact, dependable, reliable pro set-up for paid events. So, it’s strong on practical, everyday features, while consciously omitting the kind of controllerist stuff that its target market isn’t really interested in… and the MC4000 also it comes in at a very affordable price point. All in all, or mobile / working DJs wanting something portable, professional and dependable that does the basics exceedingly well, the Denon DJ MC4000 is a surefire winner. Highly recommended. Nice review, ….& seems to confirm everything i hoped would be good about this controller. I suspect this will be replacing my VCI380 in the near future. Just a shame it wasn’t at BPM to check out / buy. Don’t beat yourself up – the MC4000 wasn’t at BPM, either! One question…. have they published a TSI file for tractor, & did you try it? …oh, & split cue doesn’t work in traktor. Presumably this is software driven in serato? All of these problems you’re describing are non-existent in Virtual DJ. All these years and I’ll never understand why VDJ gets hated on. It is measurable better than Serato and Traktor in nearly every way you can think of. Wait, I’m used to VDJ supporting everything. What’s missing with the MC600 Mk2 map? Denon, take my money and ship these things already!!!!!!!! Do the Aux In & Mic inputs still work without a computer plugged in? The problem is,in Germany it retails at 466 euros,not dollars…that’s quite a difference,but it’s worth every penny anyway. Great controller. My MC3000 has a very loud aux in, but the mic in is a somewhat too quiet. I had some weird stuff happen with mine where randomly the up-faders and/or the track browse dial would scrub the playing song. It happened in different DJ programs so I sent it in to be repaired under warrantee. Just got it back today as a matter of fact.